Not everybody who adds something to a cart makes it all the way through to purchase a product. When a potential customer provides their contact information but doesn’t complete the order, we store that as an abandoned carts. It is critical to target these abandoned carts to boost sales. The best way to recover abandoned carts is to set up an automatic email reminder for customers, asking them to return to complete their order. You can send a direct checkout link to make it easy for them to return. You can set the interval as well. Abandoned Carts Recovery is available only in Plus plan. Upgrade to access abandoned cart data and enable sending of automated email for abandoned cart recovery. In the Store section, click on the Orders link on left hand side (1). On this page, you would see all the paid orders. Click on Abandoned carts link next to orders to see all the abandon carts (2). In some cases, You can also convert (3) the abandoned order into a new order. For example, if you have received the payment of that particular order outside from Pixpa store or there was some delay in payment processing at bank server at that time when the customer was trying to place an order, and you get the payment after some time. 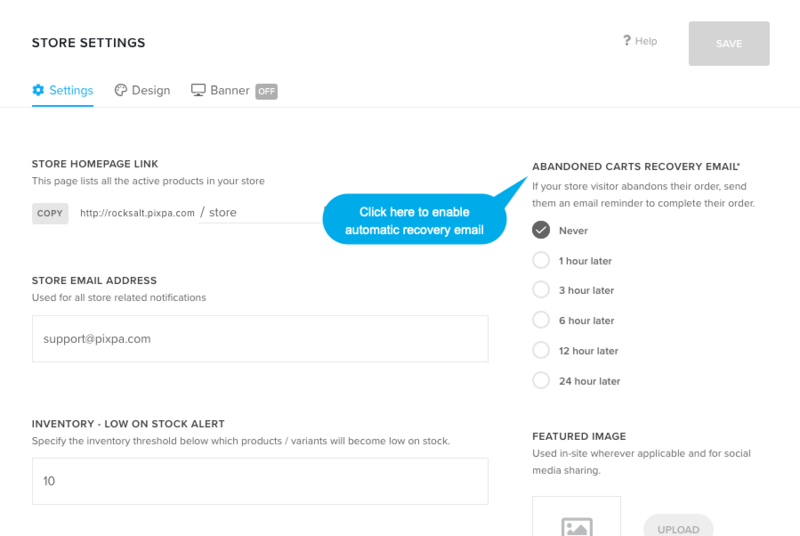 In the Store section, click on the Settings link on left hand side (1). On this page, you would see recovery email option on right side. You can select the number of hours that Pixpa will send the abandoned cart recovery email after that. Note: Do not forget to set your Timezone before recovery emails. Click here to see how.